I went to this team pro-am competition on December 18, 1996. Participants included Michelle Kwan, Nicole Bobek, Todd Eldredge, Paul Wylie, Tara Lipinski, Caryn Kadavy, and many others. Pictures from the event! It wasn't Michelle's best performance, but her team still won. However, the highlight of it for me was when Michelle came over to me after her long program! 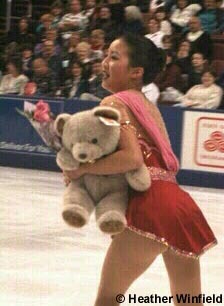 I had brought a huge bear to give to her, and after unsuccessfully trying to get her attention after her short program, she skated over to me after her long program! I gave her the bear, and she hugged me! (Pictures of Michelle with the bear! )It was even shown on TV! (Check your tapes!) I also got an autograph from Todd Eldredge after the competition!